David Hockney is one of the most accomplished and beloved artists of the twentieth century. His dexterous handling of an array of media from printmaking, painting, drawing and photography to the brushes application on the iPhone and iPad has led him to achieve international success and critical acclaim. He is a prolific artist known for his landscapes, personal subject matter and masterful use of colour. Hockney is a draughtsman whose work simultaneously embodies innovation, emotion and skill. Hockney was born into a working class family in northern England in 1937. He received a traditional education in art; training in life drawing, figure studies and cityscapes. In 1959 he joined the Royal College of Art joining other now prominent artists such as R.B. Kitaj, Derek Boshier, Allen Jones, Peter Phillips and Patrick Caulfield. Hockney achieved great success in the 1960s. In 1962 he graduated from the Royal College of Art with a gold medal for outstanding distinction, his first solo show at John Kasmin’s Gallery in 1963 London was a sell out hit and he was awarded the John Moores Painting Prize in 1967 for Peter Getting Out Of Nick's Pool. Hockney visited Los Angeles for the first time in 1964 and began to create Californian landscapes and swimming pools. During this time he started to use acrylic paint to create smooth surfaces of vivid colour and stylized imagery, capturing fleeting moments and sun-drenched vistas. In 1966 Hockney traveled to Beirut to produce a series of drawings for the Cavafy Suite. This was a series of etchings influenced by poetry written by the Greek poet C.P. Cavafy. Hockney does not illustrate the poetry; but enhances the words in a celebration of desire, love and romance. After time spent in Paris and London, Hockney moved to LA in 1978. The 1970s saw Hockney designing for the stage in theatrical and operatic productions such as The Rake’s Progress at the Glyndebourne Opera Festival and Ravel’s L’Enfant et les Sortileges at the Metropolitan Opera in New York. In the mid-1970s Hockney began to use oil paint again after a decade of working in acylic. In 1974, he was the subject of the film, A Bigger Splash by Jack Hazan. In the 1980s he began to focus on photography. Using Polaroid prints and then commercially processed colour prints he created photomontages, or what he termed ‘Joiners’ - photo collages resulting in composite images of landscapes and portraits. 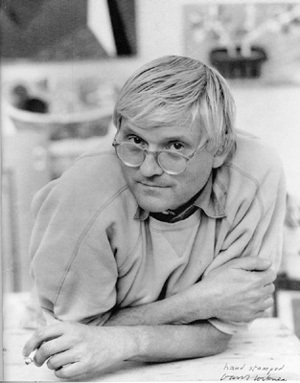 In 1986 Hockney was elected Associate Member of the Royal Academy of Arts in London. In 1997 he was made Companion of Honour and declined a Knighthood in 1990. In 2012 he accepted an order of Merit. Hockney’s versatility and enduring creativity has continued. From 2004 Hockney spent more time in Yorkshire, painting the local landscape. In 2007 he exhibited Bigger Trees Near Water or ou Peinture en Plein Air pour l'age Post-Photographique at the Royal Academy of Art, his largest painting covering 50 canvases. To create the work the artist painted outdoors in East Riding as well as using digital photography. He donated the piece to the Tate in 2008. In 2012 the Royal Academy held an exhibition spanning 50 years of the artist’s career in David Hockney RA: A Bigger Picture. The exhibition illuminated Hockney’s interest in technology, in early works that utilised Polaroid photography and colour photocopying and in a collection of recent iPad drawings. New work dating from 2005 showed Hockney painting his love of the Yorkshire landscape in huge paintings. Documenting the changing seasons in fantastically vivid colours and breathing new life into landscape painting.